The Terriers will return to Fenway Park on Jan. 5, taking on UMass-Amherst as part of Frozen Fenway 2017. Hockey East announced the schedule of outdoor games that will feature doubleheaders on Jan. 7 and Jan. 14. 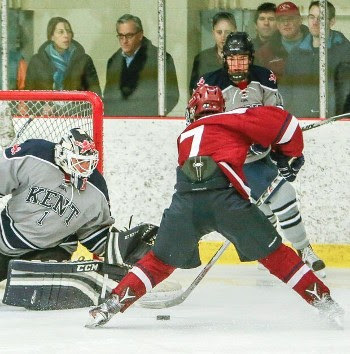 BC will meet Providence in the second game on Jan. 7. This will be BU’s third Frozen Fenway appearance. Terriers won the inaugural game at the Red Sox home, defeating BC, 3-2, (video) in front of 38,472 fans - the largest crowd to ever watch a college hockey game in the eastern United States. In 2014, BU dropped a 7-3 decision to Maine. Four Terriers have been named to the Hockey East All-Academic Team: Senior Ahti Oksanen, and freshmen Jakob Forsbacka-Karlsson, Bobo Carpenter (photo) and Max Prawdzik. College Hockey Inc. has posted a list--regularly updated--of college players who will be attending NHL development camps. Those on the list, so far: Kieffer Bellows (Islanders), Dante Fabbro (Nashville), Patrick Harper (Nashville), Clayton Keller (Arizona), Jonathan MacLeod (Tampa Bay), Sean Maguire (Pittsburgh), Matt O’Connor (Ottawa). Charlie McAvoy, selected 14th overall in the NHL draft by the Bruins, joined Scott McLaughlin for a WEEI off-season puckcast. -Also talked w/ Doyle Somerby, who arrived today. Said #Isles were "very understanding and supportive" of decision to stay at Boston U. -Somerby could become a FA after next season but says that's not his plan. "Finishing my degree is incredibly important to me and my family." -Somerby is a journalism major at BU. If hockey doesn't pan out he could join the impressive cast of BU alums on an NHL beat. Sixteen members of the Terriers have earned spots on the Women’s Hockey East All-Academic Team: Kayla Tutino, Victoria Hanson, Alexis Crossley, Jordan Juron, Sarah Lefort, Lillian Ribeirinha-Braga, Anna Streifel, Alexis Woloschuk. Sammy Davis, Mary Grace Kelley, Ashlyn Aiello, Natalie Flynn, Erin O’Neil, Sarah Steele, Samantha Sutherland and Dakota Woodworth. 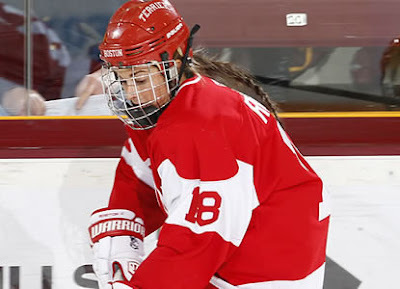 Senior Rebecca Russo has signed a contract with the New York Riveters of the NWHL. The Westport, Conn., native scored 85 points in 144 games as a Terrier. Terriers had the most first-round picks (a record-tying four) and most overall picks with six. ● Boston Hockey Blog: How many NHL draft picks does BU have rostered? ►Future Considerations: "[Patrick] Harper is an explosive offensive talent who reminds us of a young Paul Kariya." SB Nation’s preliminary rankings for the 2017 draft peg incoming freshman goalie Jake Oettinger at #16 and as the top-ranked netminder. Following Friday’s Twitter announcement of BU’s nine-man 2016 recruiting class, our friends at BurnTheBoats have updated their roster projections chart. The 27-man roster for next season will have three seniors, seven juniors, eight sophomores and ten freshmen (including one red-shirt freshman, goalie Max Prawdzik. In case you missed it, the nine newcomers have made their uniform number selections: Bellows #9, Keller, #19, Harper #21, McDermott #28, Curry #10, Chabot #11, Krys #5, Fabbro #17 and Oettinger #29. 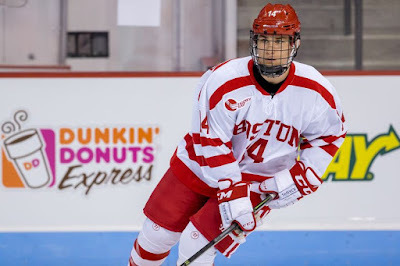 Former BU MVP Alex Chiasson was traded by Ottawa to Calgary for defenseman Patrick Sieloff. A second round pick of Dallas in 2009, Chiasson had 8 goals and 14 points last season for the Senators. 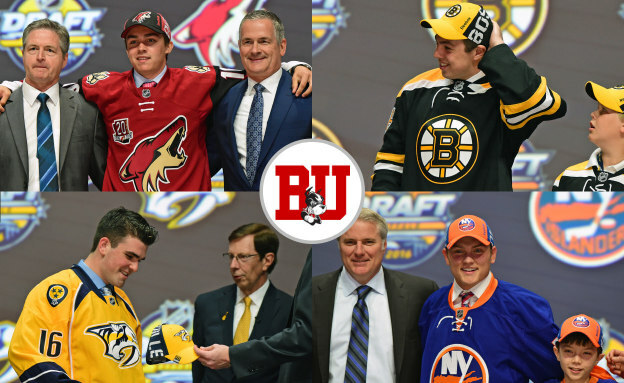 As predicted by most prospect evaluators, four Terriers were selected in the first round of the 2016 NHL Entry Draft. More specifically, four of the first 19 choices--or 21 percent of the first 19. 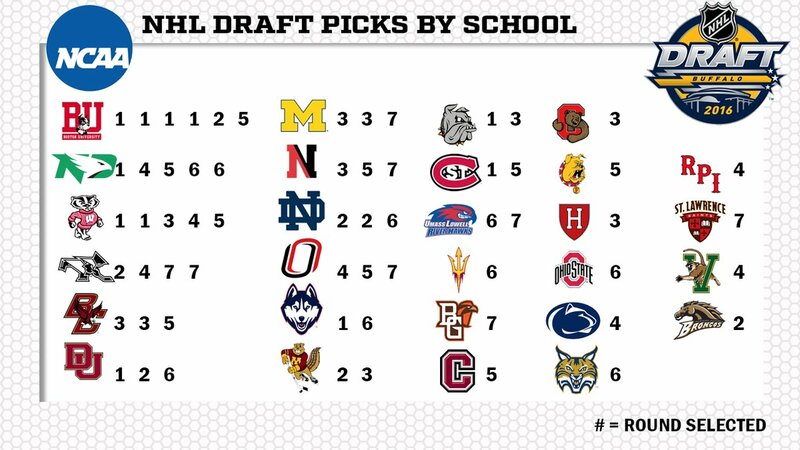 With those selections, BU ties Minnesota in 2006 for the most first-round picks for an NCAA school. Clayton Keller was the first to hear his named called, at #7 by the Coyotes. 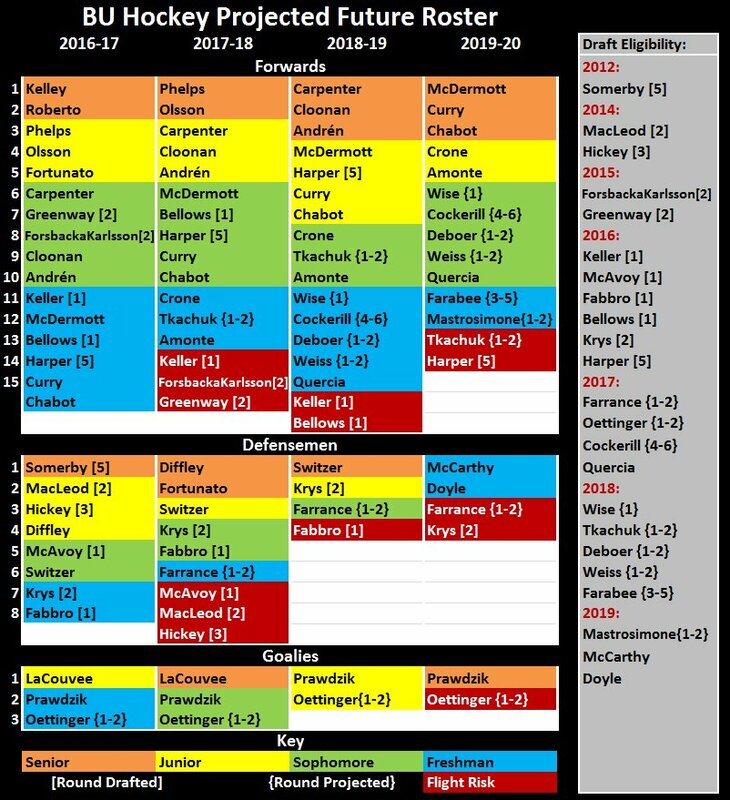 The Bruins, focused on defense, selected Charlie McAvoy at #14, followed by Nashville taking Dante Fabbro at #17 and Kieffer Bellows going to the Islanders at #19. ► ► UPDATE: On Day 2 of the draft, a pair of incoming freshmen were selected. 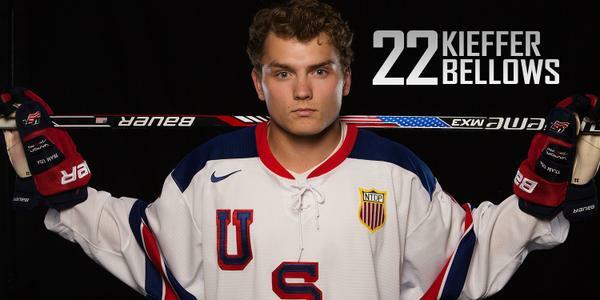 Defenseman Chad Krys was nabbed in the second round (#45 overall) by the Blackhawks. Forward Patrick Harper was a fourth-round pick (#138) of Nashville. More news to follow tomorrow. The GoTerriers.com report (link below) now has video interviews with the selected players. Keller also was the first of a record-tying 11 NCAA players selected and, along with McAvoy and Bellows, comprised 25 percent of the 12 Americans drafted in the first round. Fabbro, a longtime Nashville fan, had his name called by Predators Assistant GM and former BU standout Paul Fenton. Center Colin Wilson and chief amateur scout Jeff Kealty are two other Terrier connections to Nashville. 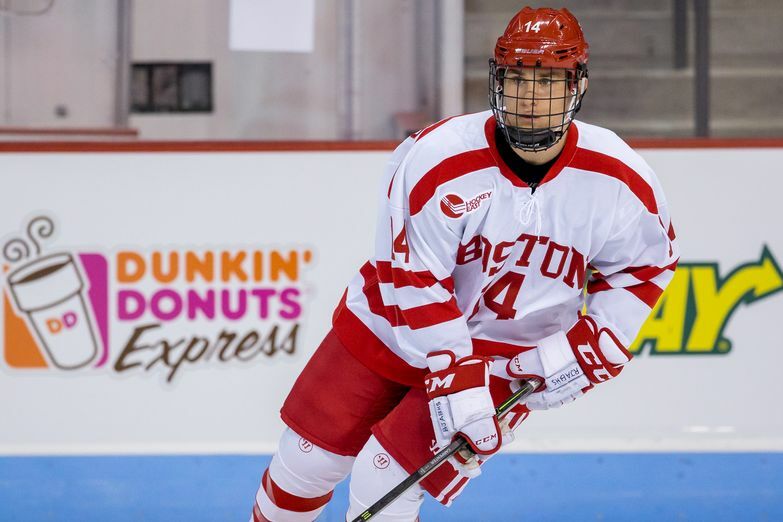 Prior to Friday night's first round of the draft, Terrier Head Coach David Quinn talked with Comcast Sports Network/New England about those four players. Terriers today announced a nine-man freshman class for the 2016-17 season, which includes a goalie, two defensemen and six forwards. The class is led by four players from the NTDP U18s: forwards Kieffer Bellows and Clayton Keller; defenseman Chad Krys; and goalie Jake Oettinger. Also incoming are the BCHL’s top blueliner, Dante Fabbro, prep forwards Johnny McDermott and Patrick Harper and USHL forward Patrick Curry. Head Coach David Quinn: “This is a class of quality & quantity. Every guy in this group brings something to our team that will help us compete for titles." 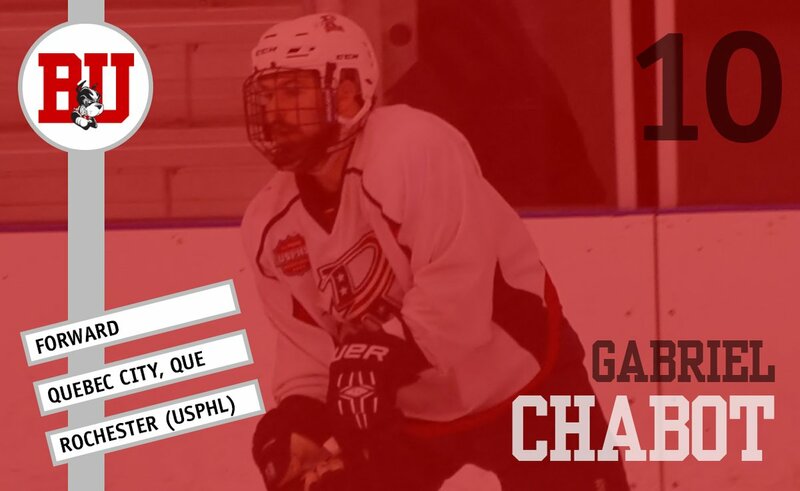 A new name among the forward recruits is right-wing Gabe Chabot from the Rochester Jr. Americans of the USPHL Premier league. The 5-9, 175 native of St. Albert’s, Alberta, who led the Junior Americans in scoring last season with 50 points (19G, 31A) in 44 games, is a converted defenseman who was moved up front last season and blossomed as a right wing. He added three goals in three playoff games. Chabot, who earned a spot in the USPHL Premier all-star game, previously played for the Portland Junior Pirates in both the Elite and Premier divisions. His father is Frédéric Chabot, a longtime minor league goalie who was drafted by the Devils in 1988 and reached the NHL, playing about 40 games for Montreal, Philadelphia and Los Angeles . CHECK OUT OR DRAFT DAY POST BELOW.